A good way to understand the singularity is to imagine explaining the internet to somebody living in the year 1200. Your frames of reference would be so different that it would be almost impossible to convey how the internet works, let alone what it means to our society. You are on the other side of what seems like a singularity to our person from the Middle Ages. But from the perspective of a future singularity, we are the medieval ones. Advances in science and technology mean that singularities might happen over periods much shorter than 800 years. And nobody knows for sure what the hell they'll bring. Talking about the singularity is a paradox, because it is an attempt to imagine something that is by definition unimaginable to people in the present day. But that hasn't stopped hundreds of science fiction writers and futurists from doing it. Where does the term "singularity" come from? Specifically, Vinge pinned the Singularity to the emergence of artificial intelligence. "We are on the edge of change comparable to the rise of human life on Earth," he wrote. "The precise cause of this change is the imminent creation by technology of entities with greater than human intelligence." Author Ken MacLeod has a character describe the singularity as "the Rapture for nerds" in his novel The Cassini Division, and the turn of phrase stuck, becoming a popular way to describe the singularity. (Note: MacLeod didn't actually coin this phrase - he says he got the phrase from a satirical essay in an early-1990s issue of Extropy.) Catherynne Valente argued recently for an expansion of the term to include what she calls "personal singularities," moments where a person is altered so much that she becomes unrecognizable to her former self. This definition could include posthuman experiences. Another singularity technology is the self-replicating molecular machine, also called autonomous nanobots, "gray goo," and a host of other things. Basically the idea is that if we can build machines that manipulate matter at the atomic level, we can control our world in the most granular way imaginable. And if these machines can work on their own? Who knows what will happen. For a dark vision of this singularity, see Greg Bear's novel Blood Music or Bill Joy's essay "The Future Doesn't Need Us"; for a more optimistic vision, Rudy Rucker's Postsingular. And finally, a lot of singulatarian thought is devoted to the idea that synthetic biology, genetic engineering, and other life sciences will eventually give us control of the human genome. Two world-altering events would come out of that. One, we could engineer new forms of life and change the course of human evolution in one generation. Two, it's likely that control over our genomes will allow us to tinker with the mechanisms that make us age, thus dramatically increasing our lifespans. Many futurists, from Kurzweil and Steward Brand, to scientists like Aubrey De Gray, have suggested that extreme human longevity (in the hundreds of years) is a crucial part of the singularity. And in the 2005 book The Singularity Is Near, Ray Kurzweil says the singularity will come "within several decades." 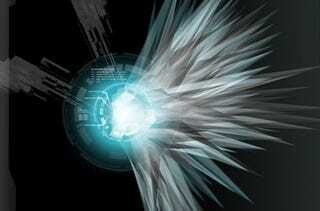 So when will the singularity really happen? It depends on your perspective. But it always seem like it's just a few decades off.